Preparations for the next Orbital Sciences Corp. cargo delivery mission to the International Space Station are on track for launch in early May, but NASA plans to ask the company to reschedule its resupply run for some time in mid-June after delays in launching a SpaceX Dragon spacecraft to the complex, sources said. All rocket and spacecraft components have been delivered to Orbital's launch site at Wallops Island, Va., according to Barry Beneski, a company spokesperson. The launch is currently scheduled for May 6. Launch processing achieved a milestone Friday with the mating of the Cygnus spacecraft's cargo and service modules in a clean room at Wallops. Beneski said the bulk of the mission's cache of experiments, spare parts and food has already been packed inside the craft's pressurized cargo module. But SpaceX, NASA's other commercial resupply provider, is in the queue for launch before the next Cygnus mission. SpaceX's Falcon 9 rocket and Dragon space capsule were grounded in late March after a component in a U.S. Air Force tracking radar short-circuited, knocking the critical asset offline. The radar is a required safety system on the Air Force's Eastern Range, so all launches from Cape Canaveral were delayed while officials sorted out the problem. The Air Force activated a standby radar in time for launch of a United Launch Alliance Atlas 5 rocket Thursday and SpaceX's Falcon 9 launcher April 14. SpaceX is delivering several tons of cargo to the space station, including two experimental packages loaded inside the Dragon spacecraft's unpressurized payload bay. A series of complex maneuvers with the station's Canadian robotics systems is required to remove optical communications and high-definition Earth viewing experiments and place them on mounting platforms outside the complex. SpaceX previously planned a launch March 16, but the company elected to forego that launch opportunity after reviews showed contamination stains on blankets in the Dragon spacecraft's trunk. SpaceX later deemed the stains were acceptable for flight. The Dragon spacecraft is expected to remain attached to the space station for up to a month. With the launch delays from mid-March to mid-April, the Dragon spacecraft would still be berthed with the complex when Orbital's Cygnus was due to arrive. The Dragon and Cygnus spacecraft use the same attachment port on the space station's Harmony module. 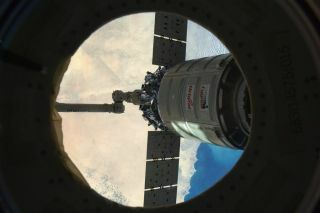 Mike Suffredini, NASA's space station program manager, said the next opportunity for Orbital's Cygnus spacecraft to fly to the outpost would be in the second week of June. Managing the space station's fleet of visiting vehicles is often a juggling act. Officials have compared the task with the job of an air traffic controller directing airplanes to take off and land in tight windows at busy airports. The space station can only support the arrival or departure of one visiting cargo or crew vehicle at a time, and officials often try to schedule time between events to give the astronauts and cosmonauts time to rest and focus on experiments. One-half of the space station's six-man crew is due to leave the complex May 13 for return to Earth. Koichi Wakata, Mikhail Tyurin and Rick Mastracchio will land in Kazakhstan aboard a Soyuz capsule to wrap up 187 days in space. They will be replaced May 28 with the launch of Maxim Suraev, Reid Wiseman and Alexander Gerst. High sun angles on the space station's orbit in early June will prevent the safe arrival of the Cygnus spacecraft until at least June 9. Sources said Orbital and NASA have not yet agreed on a target launch date in June. Officials familiar with the space station's manifest said they would make the formal decision to delay the Orbital Sciences Cygnus mission once SpaceX's Dragon is berthed at the complex. Dragon's rendezvous and capture by the space station's robotic arm is scheduled for April 16, assuming an on-time launch Apri1 14.